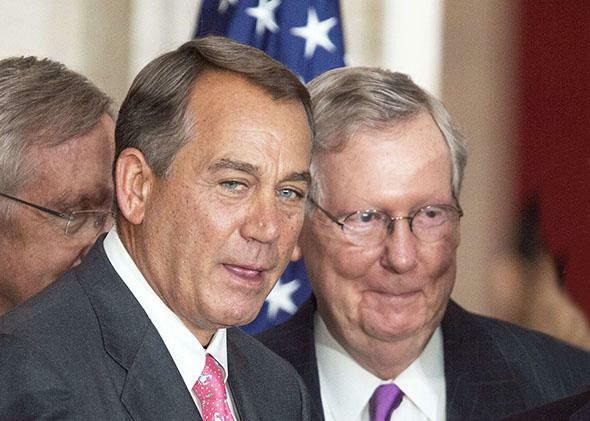 Republicans' response to Obama's immigration speech is exactly what you expected. Speaker of the House John Boehner and Republican Senate Leader Mitch McConnell. The Republican response to the president’s move on immigration is going exactly as expected. It wouldn’t have mattered if Obama said, “Republicans are the best party in America and we’re putting a statue of an elephant on the national mall”—the fact that he’s going forward with his executive action to defer deportations for upwards of 5 million undocumented immigrants means Republicans’ criticism will be unrelenting and without qualification. Sarah Palin, on her eponymous Sarah Palin Channel, said the president is “giving voters the middle finger” and “placing our nation in grave danger.” On the other end of the GOP spectrum, Sen. Marco Rubio—who helped write the comprehensive immigration reform bill that the president praised in his speech— said Obama’s move makes a legislative fix less likely. “The President’s actions now make all of this harder and are unfair to people in our immigration system who are doing things the right way,” he said in a statement. What exactly Hill Republicans will to do protect the Constitution is still very much up in the air. Sen. Ted Cruz, the de facto leader of the conservative wings of House and Senate Republican lawmakers, wrote a Politico Magazine op-ed saying soon-to-be-Majority Leader Mitch McConnell should refuse to confirm the president’s executive and judicial nominees as long as the president’s move is in place. McConnell has been coy about his plans. Others have been a little less discreet. Rep. Mo Brooks, an adamant opponent of increased immigration, suggested that the president’s move could theoretically merit jail time. Here’s the bottom line: Republicans of all stripes have come together as one in a rare moment of consensus to express the greatest opposition possible to the president’s move. That’s not a surprise. The big question: What will they do about it? And how much rancor will we see in their ranks as they figure that out?